Black and White Nails for the #31DC2017Weekly - Polish Etc. I hope you all had a lovely Easter weekend (for those of your who celebrate). For this week of the challenge, we are doing black and white nails. I know, my nails are not just black and white. But I through a little pop of color would be nice. Neon pink always goes well with black and white. So I used it for a double accent nail in this manicure. The white in this mani is Zoya 'Purity', the black is Digital Nails 'I See France" and the neon pink is Zoya 'Ali'. In my photos, the pink is looking much more coral than is does in real life. But you all know how frustrating neon colors are to capture. My original idea for this mani was to have all of the nails with the black and white gradient and just have a few squares painted in pink. But it didn't turn out well when I tried it on my two middle fingers. So full on pink nails it was! I am sure there are some great black and white nails out there this week for the challenge. This is always a fun one to do. 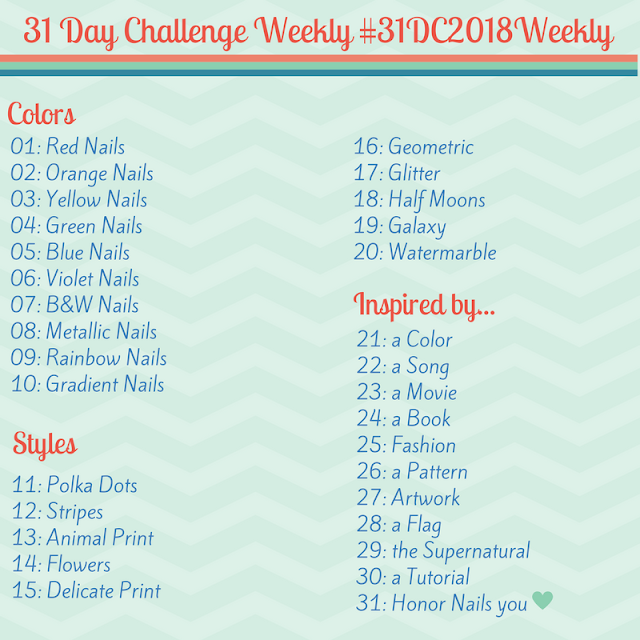 Be sure to check out my partner Lotte's look for the week as well as the other participants under the #31DC2017Weekly tag on Instagram, Facebook and Twitter. The black and white gradient is a cool idea. I like your combination very much.